But what if these preventative and perimeter security measures are defeated or otherwise nullified? We’ve seen many situations in which rapid, violent action can either render such defenses inadequate or entirely ineffective due to the immediacy of the threat. An individual’s or family’s worst nightmare is an armed intrusion into the home, and unfortunately, it can happen anywhere, at any time. This is why owning a firearm and being proficient in its use could mark the difference between threat neutralization and tragedy. Here we will look at the pro’s and con’s of optics, lasers and lights in the context of a close quarters hostile encounter. Magnified scopes are pretty much off the list with regard to a rifle or shotgun, as most such situations unfold in relatively close range. This is a type of non-magnifying reflector (or reflex) sight that gives the user an aiming reticle in the form of an illuminated dot. 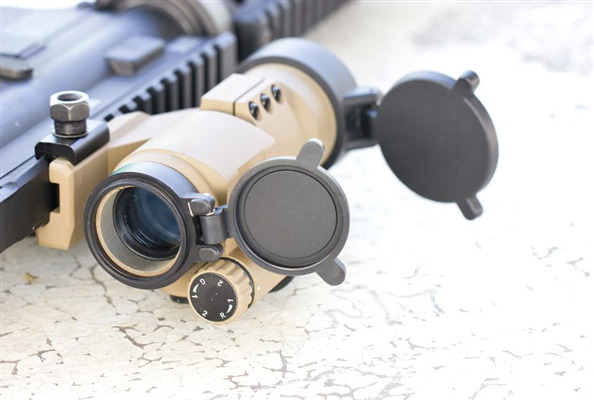 A significant benefit is that they can be used with both eyes open, unlike a scope, and acquire targets rapidly while still allowing the user to have peripheral awareness. Their effectiveness does diminish in total darkness. When properly zeroed, a laser sight indicates the bullet’s exact point of impact. Accuracy improves, especially in a crisis scenario, as laser sights allow accurate target acquisition even when the shooter is unbalanced, evading a threat, in an awkward shooting position or behind cover. Operating in total darkness, as with any equipment, has its drawbacks. You may still see the laser but not actually the target. Weapon mounted lights help in identifying a threat. Imagine an alarmed homeowner waking up to the sound of breaking glass, grabbing a gun and shooting at a shadowy figure looming in the darkness — only to discover it was a family member. A high-quality, powerful light (500+ lumens) will allow you to determine the nature of the threat – is it a drunk teenager that wandered into the wrong house or a masked criminal with a shotgun. An intense light also serves to momentarily disorient the intruder, allowing you form a plan of action. Metro Pawn & Gun invites you to check out our amazing selection of firearms and accessories. Our staff can guide you in selecting products that best fit your particular home defense plan, and answer any questions you may have. « Something to look forward to – Car Audio!